Sitting as it does in the Mediterranean, Sardinia has been a stopping point for everyone who sailed that sea, from the Phoenicians to today's cruise ships. 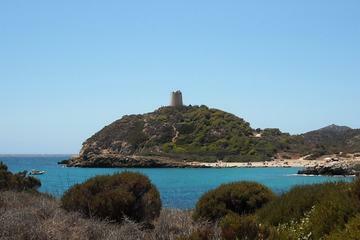 Not surprisingly, each has left its traces in the capital city of Cagliari, on Sardinia's south coast. 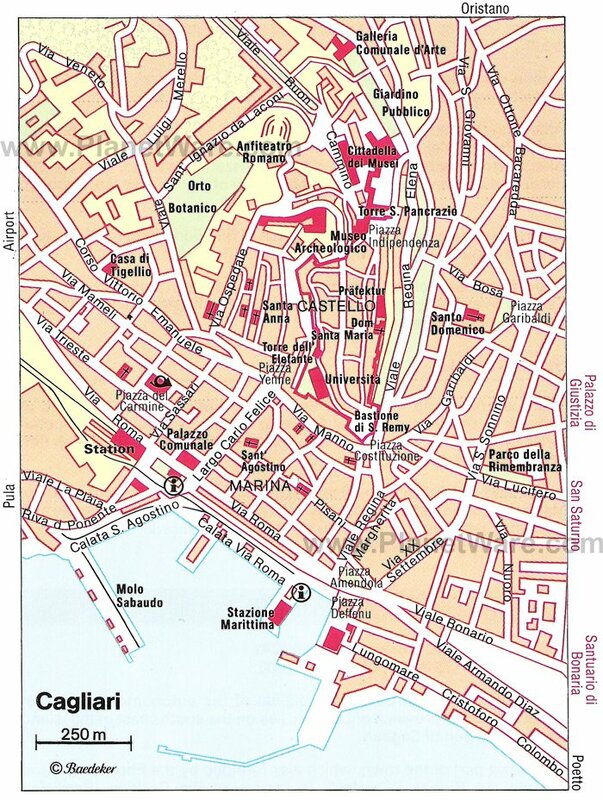 The oldest part of Cagliari is known as the Castello. It clings to the slopes of a hill that rises steeply from the harbor and has been fought over by the Pisans, Genoese, and Spanish, and raided by pirates from North Africa. Cagliari's people and traditions show this varied heritage, and the influences of different periods are reflected in its architecture as well. Facing the harbor, the Town Hall blends Spanish Gothic with Italian Art Nouveau, and elsewhere in the city, you'll recognize Neoclassical arcades and bastions, medieval towers, Roman and medieval stonework, and Baroque churches. Sardinia has its own language, which many people still speak at home and among friends, but everyone speaks Italian and many also speak English. It also has its own cuisine, so be sure to try some of the local dishes you'll find highlighted on menus. 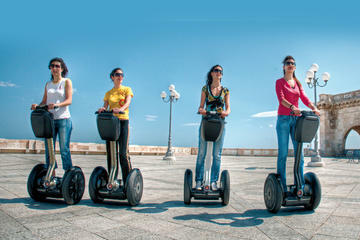 All this makes Cagliari and the south coast's attractions even more fun for tourists to explore. The wide Via Roma runs along the busy harbor, where cruise ships dock in the heart of the city. Bookmarking the corner opposite the rail station is the ornate City Hall, and beside it, tree-shaded Largo Carlo Felice rises at a gentle incline to Piazza Yenne. Above, rise the bastions of the Castello quarter, and to the right, along the base of Castello, Via G Manno, a shopping and commercial street popularly known as the Costa, leads to the Piazza della Costituzione. From this piazza, the beautiful Viale Regina Elena descends sedately to the Maritime Station, completing the boundaries of the Marina quarter. Begin your tour of Cagliari by climbing the marble steps of Passeggiata Coperta (or taking the free elevator) from Piazza della Costituzione to Bastione San Remy. Although this and other bastions, such as the higher Bastione Santa Caterina, were built to defend the Castello quarter, stronghold of the Pisans and Genoese and briefly home to the Savoy royal family, today, they provide an ideal vantage point for tourists and locals to enjoy sweeping views. It's a perfect spot to get your bearings by picking out landmarks - the harbor, the Marina quarter below, the leafy Villanova neighborhood to the left, and the hilltop Basilica di Nostra Signora di Bonaria. Many of the original medieval walls were torn down, some to build the later bastions, but one imposing tower and gate remain as an entrance into the Castello quarter. The easiest way to reach it is from Piazza Yenne, the large square at the upper end of Largo Carlo Felice. Take the elevator behind Chiesa di Santa Chiara, and at the top, walk right, to Torre dell'Elefante. The tower was part of fortifications that were built in haste to protect Castello from the Aragonese, who were invading Sardinia from Spain. Along with the carved elephant that gives the tower its name (on the lower side), look for the coats of arms of old families, including the powerful Visconti from northern Italy. The original portcullis from 1307 is still in the gate. Why an elephant? You'll hear as many explanations as there are guides, but nobody knows for sure. A gate in the old Torre dell'Aquila above Bastione San Remy leads into the narrow main street of the old town, Il Castello, a warren of arched passageways, steep lanes, and flights of steps. Straight ahead in the terraced Piazza del Palazzo is the cathedral of Santa Maria, built by the Pisans in 1312. On the higher terrace are the Palazzo Arcivescovile (archbishop's palace) and the long façade of the Palazzo Reggio, where the Savoy royal family lived after Napoleon captured Turin. The cathedral's central façade is something of a 1930s restoration disaster. The original Romanesque façade was replaced in 1722 with more fashionable Baroque decoration. Two centuries later, restorers tore that off expecting to uncover the original. Finding nothing underneath, they covered it with a poor imitation of Romanesque. More interesting are the unrestored 13th-century walls to the left and on the campanile, where you can spot parts of recycled pre-Christian and carved Roman tombs, one imbedded upside down. Just inside, flanking the entrance, are the two halves of a pulpit from Pisa Cathedral, a masterpiece of 12th-century sculpture that was presented to Cagliari after it was replaced. Look carefully for the frog carved into the relief, the "signature" of the 12th-century Pisan master, Maestro Guillermo, builder of the Leaning Tower. Other artistic and historical treasures fill the cathedral, among them exquisite silver in a small Gothic chapel and two crypts (you'll see the staircase) containing nearly 200 early Christian martyrs excavated from the old San Saturno church and identified as saints. Look up to admire the crypt's elaborate ceiling. At the far end of Piazza del Palazzo, an arch leads into Piazza dell'Indipendenza, where you'll find the Torre San Pancrazio, a watch tower built in 1305 to defend the old bastion. Beyond, through another arch, is Piazza Arsenale, and in it, the Museo Archeologico Nazionale. Its beautifully displayed Punic, Greek, and Roman collections are very well interpreted, but what makes this museum a must-see attraction for tourists is the wealth of information on Sardinia. Here, you'll find impressive collections of ancient gold work and the bronze statues and other treasures discovered in the nuraghi, those ancient and mysterious round stone structures found all over the island. This museum gives an invaluable overview that makes these attractions far more meaningful and opens a window into the lives of people who lived here more than 3,000 years ago. In addition to the Archaeology Museum, this repurposed bastion holds several others. Of these, the most interesting to tourists is the National Art Gallery, which displays some magnificent gold and carved painted altarpieces from Cagliari's destroyed Baroque churches. (The city was heavily damaged by World War II bombing, which left several of these in near ruin.) The unusual Anatomical Waxes Collection and a museum dedicated to the art of Thailand complete the complex. From the bastions near the museums, you can look down into a Roman amphitheater dating from the end of the first century, set into a natural curve in the hillside's rocky slope. This is the city's most important Roman remain, and when it is not closed for archaeological study or restoration work, it is used for concerts and performances. It is sometimes possible to visit it with a guide when it is closed for restoration. For a glimpse of local life, as well as a look at the tremendous variety of seafood that awaits you on Sardinian menus, make a morning trip to the city's principal market, the covered Mercato di San Benedetto. Along with one of Italy's largest and best fish markets, which fills one entire floor, you'll see the seasonal products of Sardinia's fertile land. Look especially for the sheep cheeses, for which the island is famous, and for the distinctive pasta shapes (easy to carry home as souvenirs). This is a good place to find picnic provisions for a day trip. Crowning a hilltop southeast of the city, and a prominent landmark seen from Bastione San Remy, is the Sanctuary of Our Lady of Bonaria. The church houses a venerated statue believed to have stopped a storm in time to save the crew of a Spanish vessel shipwrecked in the Gulf of Sardinia, off Cagliari, in the winter of 1307. The small Spanish Gothic church dates to the 14th century, and the larger Neoclassical basilica was built in the 18th century. The Sanctuary Museum holds votives and archaeological finds. Hotel Villa Fanny: 4-star luxury, short stroll to town, stylish decor, high-quality linens, lovely garden. Hotel Regina Margherita - Cagliari: mid-range pricing, fantastic location, contemporary style, well-appointed rooms, free parking. Hotel Flora: affordable rates, eclectic decor, multi-jet showers, helpful staff. La Terrazza: budget hotel, steps from the old town, air-conditioned rooms. On a narrow peninsula about 32 kilometers south of Cagliari, near the beach resort of Pula, are the extensive remains of the Phoenician settlement of Nora, later taken over by Carthaginians and later still, by the Romans. In the forum, baths, temples, streets, walls, villa foundations, and well-preserved mosaic pavements, you'll find evidence of all these cultures, an open-air museum of Sardinian antiquities in their original setting. The Roman amphitheater is so well preserved that it is still used for concerts. The site is a large one and rough walking in places, so wear sturdy shoes and allow at least two hours to see it all. The nearby Byzantine-style church of Sant'Efisio was built in 1089 to mark the site where the saint was beheaded by Romans in AD 303. At the Festival of St. Efisio (May 1-4) a colorful procession of several thousand pilgrims in 16th- and 17th-century costumes carry a statue of the saint here from Cagliari. The coastal road heading east from Cagliari to the town of Villasimius (about 48 kilometers from Cagliari) and the Costa Rei combines scenery, history, and a sampling of Sardinia's fabled beaches. At Capo Carbonara, the extreme southeastern point of Sardinia, is 17th-century Fortezza Vecchia (Old Fort), and pretty Villasimius has its own archaeology museum of Roman and Phoenician artifacts. But most tourists and locals come here for the glorious uncrowded white-sand beaches and turquoise water, backed by hills of olive and almond groves.